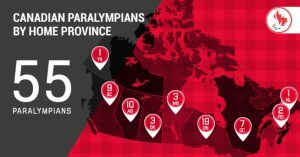 Meet your Manitoba connected Olympic and Paralympic athletes! Sandford’s Dennis Thiessen is a three-time national champion, world champion, and Paralympic gold medallist in wheelchair curling. Dennis began the sport in 2005 when a friend introduced him to it. Dennis’s career started to pick up in 2008 when he won his first bronze medal at Canadian nationals. After winning his first national championships with team Manitoba in 2011, Dennis was named to Team Canada. Dennis won the world championships with Team Canada in 2013 and a gold medal at his first Paralympics at the 2014 Sochi Games. A defending Paralympic champion, Dennis Thiessen is looking for another gold medal in PyeongChang. Jamie Anseeuw began competing in wheelchair curling when he was recruited by Dennis Thiessen in 2014 to curl for Team Manitoba. Jamie says wheelchair curling is a great outlet for his competitive side, and has quicky risen through the ranks in Canada throughout the last four years. Now a two-time national champion, Jamie will make his Paralympic debut in PyeongChang as Team Canada’s alternate, where he hopes to help Canada win its fourth consecutive Paralympic gold. Canada is the only nation to have ever won gold in wheelchair curling at the Paralympic Games (Turin 2006, Vancouver 2010, Sochi 2014). Bryan Sholomicki was involved in a motorcycle accident in 2009, leaving him with an amputated leg and third-degree burns over 60% of his body. After a long rehabilitation process, Sholomicki was eager to try sledge hockey, which he did for the first time in 2012. The Winnipeg native made his debut with Canada’s senior national team in 2015, and was named an alternate captain the following season. Currently living and training in Toronto, Ontario, Sholomicki will make his Paralympic debut at the 2018 Paralympic Games. Bryan wears jersey number 20. John Leslie will compete in the Men’s Snowboard Cross SB-LL2 and Men’s Banked Slalom SB-LL2 events.